San Diego-based eyewear brand SPY®—known for its innovative Happy Lens™ technology—is back to serve up the third edition of their unique and extremely challenging Spring Classic cycling event, the SPY Belgian Waffle Ride (BWR), on April 27. Returning in true Flemish fashion, the BWR—complete with moules-frites, ale, waffles, and more ale—punishes worthy entrants with a 136-mile cycling route and 11,000 feet of arduous climbing through the unrelenting hills of San Diego County. The third annual fete will mark the largest cycling extravaganza in Belgian Waffle Ride history, and is staged to attract 500 of the best of the biking community, including Olympians; World, National and State champions; professional and amateur cyclists; and surf, motocross and bike industry luminaries. 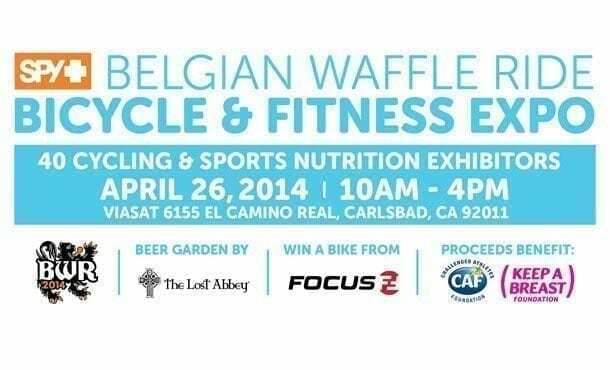 The elite event kicks-off on ViaSat turf at 6:30am, April 27, with a catered breakfast for the participants, replete with fuel-sized portions of authentic Belgian waffles. The pain-promising ride will ensue at 8:00am, beginning with a neutral 20-mile processional southbound from Carlsbad before things heat up around the 116-mile-to-go mark, where the first of many difficult dirt sections—amongst guaranteed sniveling—will commence along with a relentless barrage of dirt, mud, single-track and water crossings to emphatically punctuate the 11,000 feet of climbing. Riders will be treated to food and beverages on-course while contending for a variety of awards, including the kUDOs award—an accolade in memoriam of Udo Heinz, a fallen cyclist, husband, and father of two who was struck and killed near Camp Pendleton in 2013. Remembered for his vigor on the bike and in life, the kUDOs award will be presented to the rider who exudes the most heart—a happy vitality—on course. The Lifestyle and Fitness Expo portion of the event—as well as the event’s start and finish—is being hosted by ViaSat, a communication company and North County’s largest employer. The expo will begin on April 26 at ViaSat’s main office in Carlsbad, CA, where athletes can pick up race packets and peruse the offerings from event sponsors and exhibitors between noon and 5:00pm. The expo will begin at 6:30am on April 27, and run throughout the duration of the event until beers, jeers and awards are distributed for heroic efforts and lack-thereof. Custom-made jerseys, designed by Joe Yule of StageOne, will go to the overall winner (“General Classification—King of the Waffle”); the best overall climber (“King of the Mountain”); the hardest working rider (“Belgian Hardman”); the kUDOs award for most spirited; and the most aggressive sprinter. There will also be a distinction for the most selfish, uncooperative, inconsiderate rider—the “Wawful Freddy”—who will be nominated by a panel of on-course marshals. “Over the course of last year’s 130 mile route, I had good moments, bad moments, and many others that I completely blocked out. If seeing a grown man cry makes you uncomfortable, the BWR isn’t for you,” recounted last year’s victor, Neil Shirley. Drawing world-renowned cyclists from around the nation, members of SPY’s elite cycling team—including Jonathan Page, Dave Zabriskie and Nicole Duke—will also get back in the saddle to vie for top honors. Registration for the event is available at bikereg.com/Net/spybwr. Registered SPY Belgian Waffle Riders will help support the event’s cause, the Challenged Athletes Foundation® (CAF), whose mission is to provide opportunities and support to people with physical disabilities so they can pursue active lifestyles through physical fitness and competitive athletics. Additional sponsors include ViaSat, MRI Endurance, SKINS, Razer, Harmony Bar, Giant Bicycles, Lost Abbey Brewery, Lake Cycling Shoes, SRAM and Zipp. For more information about the SPY Belgian Waffle Ride, go to facebook.com/SPYBWR. For more information about SPY’s cycling, multisport and endurance sports goings-on, log-on at facebook.com/spyperformance. For info about SPY products, athletes and events, log-on at spyoptic.com and facebook.com/spyoptic.